You will love this beautiful horizontal card. With crisp contrast and bigger letters, it is clear and easy to read. Also, the soft colors and subtle shading enhance concentration and attention. It will be a favorite of anyone who has focus, concentration or reading issues. 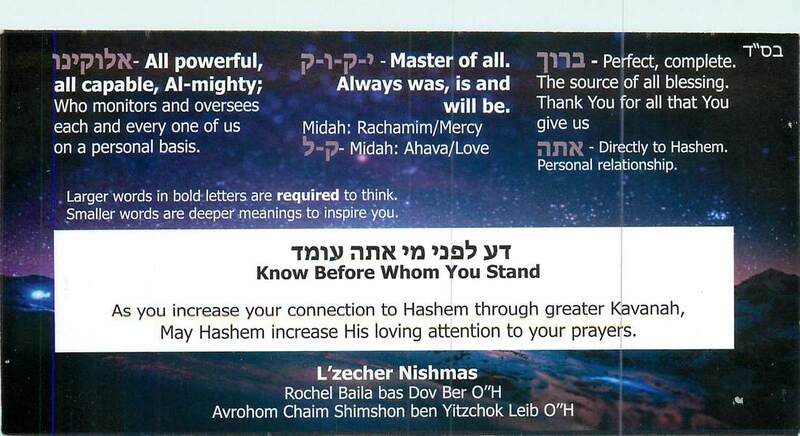 On the back is the daily dedication by the Chidah for your intention when saying Hashem's names, which fulfills the halacha, except for Shema and the first paragraph of Shmoneh Esrei. Similar in layout to the above 3" x 6" horizontal davening Kavanah Kard, this night sky card is another beautiful horizontal version. 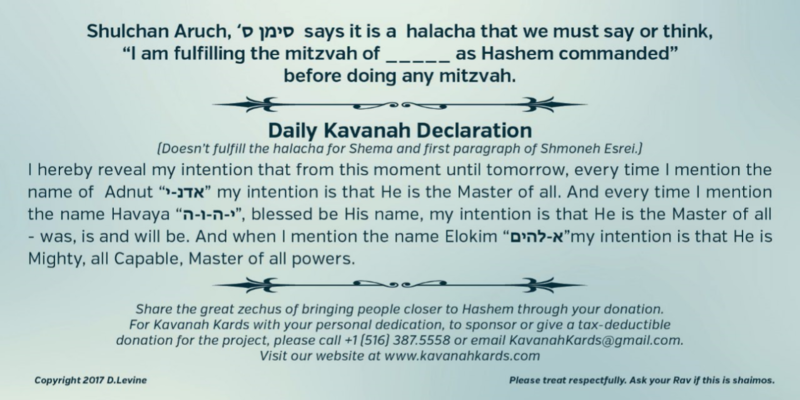 It has the Daily Declaration of the meanings of Hashem's names, but not the kavana of mitzvahs statement on the back that is found on the above green 3" x 6" and 3" x 4" pink & blue. This beautiful Kavanah Kard also has the benefit of being a guide under the line being read, to keep your eyes from having to look away from the text, and its 4" width is perfect for smaller sidurim. 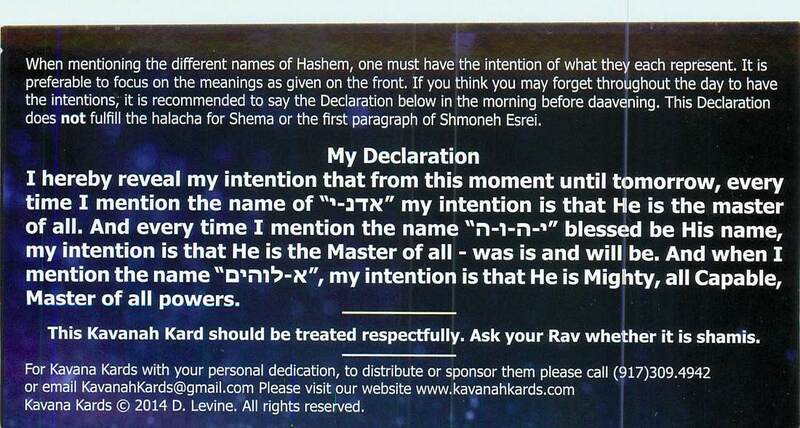 Also, it has the Daily Kavanah Declaration to say every morning about your intention when saying Hashem's names. The Declaration helps if you forget to focus (except not for Krias Shema and the first paragraph of Shmoneh Esrei). This Kavanah Kard Bookmark is an updated version of the first Kavanah Kard. It has larger print, with the meanings for only Hashem and Elokeinu, which we are required to think. To use this card, place it anywhere in your siddur with the definitions visible above the page. That way you can always see the meanings of the words, without having to move it from page to page. Look at the meanings before you say the Hebrew, to prepare your heart and mind to speak them to Hashem. ​On the back is the daily dedication by the Chidah for your intention when saying Hashem's names, which fulfills the halacha, except for Shema and the first paragraph of Shmoneh Esrei. It can also be posted on signs, available where people are saying the blessing after meals and to have handy wherever you go to help you have greater connection and focus. They will be enjoyed by everyone you share them with, so keep a supply handy. Standard business card size, this card has the same format on front as Business Card Size 1, but with a plain background. This version is used by men and is also helpful for women who may find the flower background distracting. Keep in your siddur to focus on the meaning of Hashem's names while you daven. They can also be posted on signs, available where people are saying the blessing after meals and to have handy wherever you go to help you have greater connection and focus. They will be enjoyed and put to good use by everyone you share them with, so keep them handy. This beautiful member of the Kavanah Kard family helps you elevate whatever you do (or refrain from doing) in order to get or stay healthy to be able to serve Hashem. Keep them with you and post them wherever you will see them as a reminder to dedicate and make what you are doing more meaningful. They will help others gain more merit and make mundane actions more spiritual.